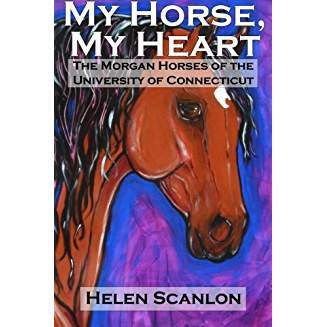 My Horse, My Heart: The Morgan Horses of the University of Connecticut is the story of the UConn-bred Morgan horse. Sturdy, strong and proud—each foal born in the UConn barns can be traced back to the magnificent Morgan horses bred for the cavalry at the United States Government Horse Farm in Vermont. It is also the story of the many students, owners, trainers and breeders who loved them. The Morgans of UConn are so much more than the herd stallions and the broodmares. They are the foals that grow up to be champions, teachers, partners and best friends. They are the horses that can elicit the joy of younger days, trotting in a dusty show ring under a summer sun, and walking out with a ribbon clipped to the bridle. There are trunkfuls of those ribbons, somewhere, each one holding a proud memory of that special horse: the UConn-bred Morgan.